A robber with a long criminal record who killed a Norwegian policeman during Norway’s largest heist in history, the so-called NOKAS robbery, is being released from prison after serving just 10 years of a 16-year sentence that could have been extended. Another man involved in the robbery was also freed, prompting calls for a change in the law that allowed such early release. 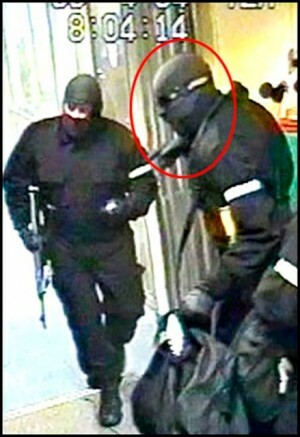 Kjell Alrich Schumann and Metkel Betew were among the group of commando-style robbers who stormed into a NOKAS currency depot in Stavanger during Easter week of 2004. Carrying machine guns, masked and wearing helmets, they made off with more than NOK 50 million in cash and foreign currency. During their escape, they engaged in a gun battle on a downtown street, during which Schumann killed veteran police officer Arne Klungland. Most of the NOKAS robbers were eventually rounded up and sent to jail, with some of them also serving time for ordering or organizing the famous theft of the Edvard Munch paintings Scream and Madonna from the Munch Museum in Oslo later that summer. The idea was to create so much work for the Oslo police that they’d be distracted from the NOKAS investigation. The majority of the cash stolen in the NOKAS robbery was never found. Now, just 10 years later, both Schumann and Betew are being released from their sentence of forvaring, which in Norway is supposed to be a strong form of custody aimed at protecting the public from the most dangerous criminals. Custody can be extended if the court still determines the convicts to be dangerous. The forvaring law also, however, sets a minimum time in prison of just 10 years, meaning that convicts can apply for release after serving a 10-year-term. Schuman and Betew, both with long criminal records, applied and succeeded in winning release despite objections from the prosecution. An appeal to the Supreme Court was rejected meaning both will now be freed, albeit with some restrictions on their movements. Schumann, also known as a master of disguise earlier in his criminal career, has said he intends to move home to Finnskogen in southeastern Norway and has a job lined up. His release especially has now spurred reaction from a wide range of prosecutors, Members of Parliament and the Government, with Justice Minister Anders Anundsen predicting that the forvaring law will now be quickly changed. Both the conservative government parties and opposition parties in Parliament agree that the minimum 10 year release time should be increased to at least 14 years, and the maximum term for forvaring custody to 30 years. “Today’s system doesn’t meet our goals,” Anundsen told Norwegian Broadcasting (NRK). Hadia Tajik, who heads the justice committee in Parliament for the Labour Party, agreed, acknowledging that serving only 10 years after killing a police officer and carrying out such a dramatic robbery “is not in line with the general public’s sense of justice.” Norway is known for relatively lenient jail terms, and she said that Labour now also wants to increase the minimum length of a forvaring sentence. That secures the conservative government a majority for the government’s proposal to do so, and several other MPs were nodding as well. Some also want minimum terms longer than 14 years, which is the minimum release period for criminals receiving Norway’s longest regular sentence of 21 years in jail. Forvaring is supposed to be tougher custody, so it’s a paradox that Schumann and Betew end up being released before others sentenced to what were supposed to be milder prison terms.